The destruction wrought by the 9.0 Sendai Earthquake and Tsunami is truly appalling. Untold lives have been lost. Thousands of square kilometres were obliterated by the water which swept up to 20km inland. The death toll officially stands at 1,000-2,000 but it must really be much higher. One town alone reports 10,000 of its 23,000 residents missing while several cities with populations in the tens of thousands were subjected first to shaking, then tsunami, and finally fires. There is still no comprehensive picture of the damage done to these cities and how much of their populations managed to escape before the tsunami hit. Some 500,000 people are in emergency shelters and power is out to 10% of homes in the country. One 60 year old man was rescued from the roof of his house, which had been swept 15km out to sea. The tsunami caused damage as far away as Crescent City, California, where the harbour was wrecked and one spectator drowned. Some coastal areas are now below sea-level while towns and rural areas remain submerged by stagnant tsunami water. Amazing before and after shots of the tsunami damage. Cooling problems have been reported at six nuclear reactors. One appears to have partially melted down and a hydrogen explosion blew away its outer containment building although the inner containment does not seem to have been breached and radiation release has been minimal. A second reactor appears to be on the verge of meltdown. The most affected region is not near Japan’s economic heartland, nonetheless the economic cost will be huge. Estimates of physical damage run from US$100 billion to $1 trillion but it is impossible to really know. As we know from Christchurch there will be an immediate economic hit followed by increased activity due to the rebuilding. The quake has been upgraded to 9.0 on the Richter scale. That means it released about 2 exajoules of energy, which is 474 megatonnes, nearly five times the largest ever man-made explosion – the Tsar Bomba – and 11,000 times more powerful than the Christchurch earthquake. Apparently, the maximum ground acceleration from the quake was a lot less than Chch2 (0.35g vs 2g), which meant buildings would have been less likely to be knocked over but shaking went on for five minutes and the repeated stressing would have created severe damage. The huge cracks in roads are evidence of that. Japan moved around 8 feet closer to North America and moved downwards about 2 feet due to the movement of the plates. The means the Earth’s mass is now slightly more concentrated around its axis. Like an ice skater bringing here arms in to spin faster, conservation of angular momentum means the Earth’s spin has sped up making a day 1.6 milliseconds shorter. Interestingly (for certain values of ‘interesting), this actually makes a day closer to 24 hours long. See there are 86,400 seconds in 24 hours. The STI unit for seconds is set as 9,192,631,770 periods of the cesium atom and that hasn’t changed but, because events like this earthquake change the speed of Earth’s rotation, there were about 86,400.002 seconds in an average day prior to the quake. Now, it will be much closer to 86,400, possibly meaning fewer ‘leap seconds‘. Every geosynchronous satellite will also have to be moved slightly inwards. There orbits will also have to be adjusted for the fact that the earthquake knocked the Earth’s axis off by 10cm. Please visit the web pages of the IERS at http://hpiers.obspm.fr/ and look at the plots showing how much the length of day changes and how much the pole wanders. The effect of the earthquake is 1000 times smaller than the other effects seen in those plots. The changes from the earthquake are immeasurably small. Funny that the (rather narrow) road split straight down the centre line like that. At least it’ll be passable. And yes the road split along the yellow line is curious. I reckon the left lane has been on some kind of supports and the yellow line traces the natural contour of the land. 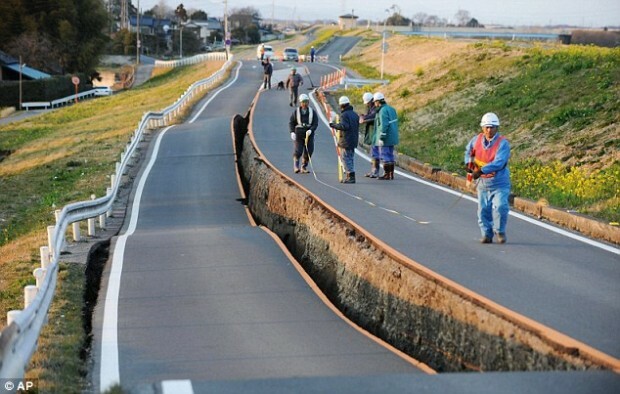 It’ll be cool if they can just add in some supports and leave it like that, rather than re-laying the whole road. There’s a funny road in a cul-de-sac in Hamner Springs split on a hill kind of like that. One side has a big sloping hill, so when you get to the end of the cul-de-sac and do the 180º corner you go up the hill, and then go down hill again until the lane matches the same level as the one you came in on. Theoretical – although designed for ~100MT the actual explosion was ~50MT making the earthquake ~9.5 times stronger. Lookng at the before and after photos, and the different effects in areas with an undeveloped/relatively undeveloped coast strip and/or barrier islands and sand spits, who wants a slice of the high value low lying coastal development now? The equivalent shake to the east of us would mean bye bye Omaha, Ruakaka, Mangawhai, Ngunguru, Pakiri…(guess which part of the country I live!). We thought we had it tough. It was like… arrrgh, earthquake! Run for your lives! arrrgh, earthquake! Run for your lives! then a bit later… arrrgh, tsunami! Run for your lives! then a bit later… arrrgh, fire! Run for your lives! then a bit later… arrrgh, nuclear holocaust! Run for your lives! It is like some sick joke. …there’s also a volcano that’s decided to pip it’s squeek. It’s hard to keep up eh? I’m expecting to open the paper tomorrow to see a picture of a giant moth battling an even bigger lizard. Are you by chance referring to the Nat leader and the ACT leader appearing (in the order you set out) in such a picture? I’ll bet you that today Ken Ring predicted the Sendai quake. If you bothered to read, you would find that Ken Ring does not make predictions. Opinions! Predictions! Equally crap. Whats the difference apart from semantics. Some comfort is that it would be most unlikely for a massive-size earthquake to revisit the same region so soon. In other words, Christchurch may be one of the safest places to live-in for a while, from here on. I guess that can’t be called a prediction. The GNS guy on TV said something similar – that because the faults under Chch have quaked they don’t have the build up of stress that other faults elsewhere do, therefore it’s more likely that a big quake will now happen away from Chch (inland Canty and the Alpine fault if I recall correctly). Ken Ring’s work deserves critique, but quibbling over semantics, (and inaccurately at that) hardly counts as rationale critique. Yeah, that’s like how Ghaddafi can’t stand down as leader because he isn’t the leader and doesn’t have a formal title. Closer to home; The Northern Advocate : 14th March 2011, Sea surges strike Northland in tsunami aftermath.